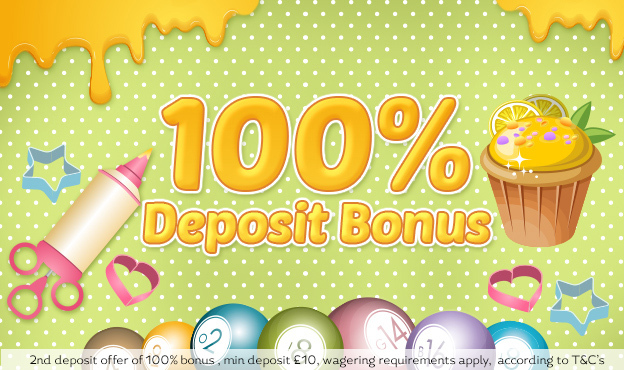 Cupcake Bingo | Get A 100% Second Deposit Bonus! KEEP PLAYING WITH 100% BONUS! Make your 2nd deposit at Cupcake Bingo + you’ll be rewarded with 100% bingo funds. That’s right – deposit £10, but keep playing all our fab bingo with £20! You can claim up to £30 with this bonus, so make the most of it while you can. Happy cup-caking! Player is only eligible for one Second Deposit Bonus. The offer is 100% bonus for the second deposit (Minimum deposit £10, Max bonus £30). The third deposit bonus is available to all Cupcake players who have deposited once (1 time) from the moment that they have registered. Bonus is credited in Bingo Bonus funds. Cupcake Bingo reserves the right to stop this promotion at any time.